Villa Vista is a luxury spacious villa, five minutes drive from Gocek, the marina and the beach. 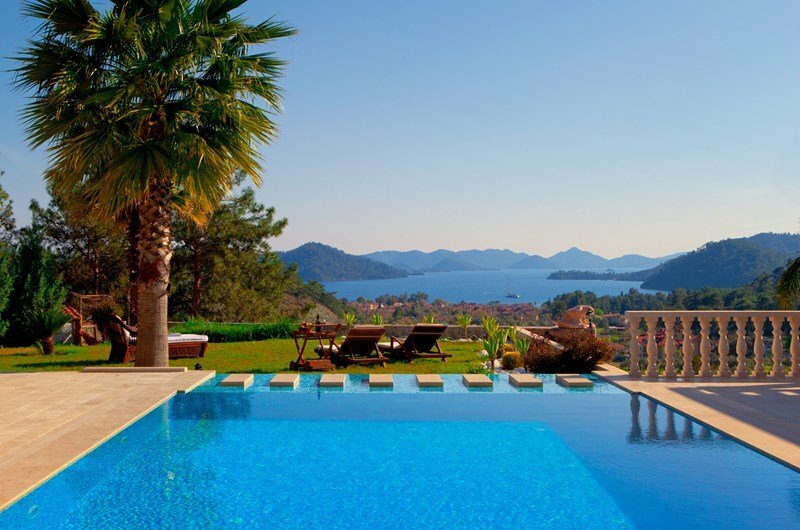 Villa Vista is a luxury spacious villa, five minutes drive from Gocek, the marina and the beach. The villa benefits with a large pool&jacuzzi, outside bar and pergola which makes it ideal for al fresco dining with glorious views of the bay. As well as the marina and the beach, Gocek offers a wide choice of restaurants, bars, bistros and boutiques. With luxuriously easy access to the whole region, by land or sea. As a resident of Villa Vista, the Mediterranean coast and the historic locations nearby are effectively part of your immediate surroundings. For your exclusive use at any time are a 350HP Crownline 262 EX speed boat and a seven-seater Mercedes Vito with leather seats and flat screen with your captain/chauffeur. Having your own speedboat for your holiday also means you can go water-skiing or wakeboarding whenever the need for speed strikes you. Your resident captain/chauffeur will convey you by land or sea to any of the remarkable sites and secluded beaches that take your fancy or enjoy, as the resident cook will prepare a mouth-watering array of traditional Anatolian dishes or a delicious barbecue for you. Travel in to the grand ruins of Tlos, Letoon, Pinara or Xanthos; spin out to the hidden paradise of 12 Islands, including Cleopatra's fabled sandy beach; cruise down to the Butterfly Valley, or the Blue Lagoon at Oludeniz. This region offers some of the most attractive walking in Turkey. Located in the southwest of the aegean region, the area offers visitors an excellent climate, beautiful coastline and sparkling turquoise seas. The area is carpeted with pine trees that look down onto olive groves. Bobbing bowsprits, busy bistros and bustling shops. The pleasant, spruce maritime market town is a delight. A walk along its seafront, with green hills rising all around, beckons day and evening. In Gocek bay, 12 pretty islands await. A languid cruise threading its way between them combines relaxing tranquillity and aesthetic delights – many have pristine beaches, others offer delightful restaurants or are historically significant. Discover the ruins of Cleopatra’s hamam in which you can still bathe. Gocek is a perfect base from which to explore some of Turkey’s most popular places – the Blue Lagoon, the Greek ghost town of Kaya, and the caves, mud baths and turtles of Dalyan. Relax into your holiday almost immediately: the town is only 25 minutes from the airport.